How to make Custom WhatsApp Stickers – WhatsApp Stickers is the new trend. You might have seen your friends sending WhatsApp Diwali Stickers during the festive season. WhatsApp Stickers feature was only available to Beta users that time. The good news is it’s officially released now to every WhatsApp user. 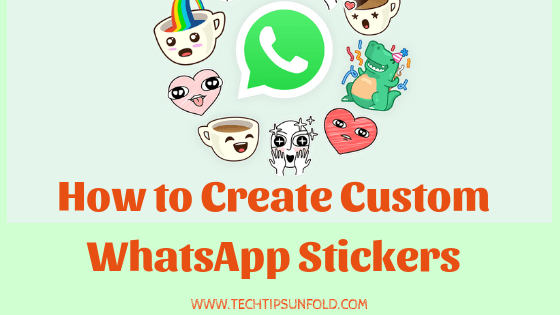 Now in this blog post, we will let you know How to use Sticker feature in WhatsApp and also to create your own custom WhatsApp stickers. We generally use Emojis to express the feelings in more convenient way. Social media apps like Instagram, Telegram, Hike etc. have taken these emojis feature to the next level and introduced stickers in their apps. Following these footsteps, the biggest messaging platform on the earth, WhatsApp, has also introduced Stickers few weeks back and they are bit hit during the Diwali days. 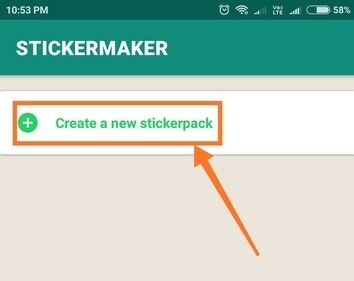 How to get WhatsApp stickers features? You don’t have latest version of WhatsApp? Then probably you haven’t got WhatsApp stickers feature then. Earlier this feature was released for beta version users and then last week it is officially released world wide. Just follow the below steps to get the WhatsApp stickers feature on your Android or iOS mobile phone. Search for WhatsApp app in play store or app store. If you haven’t got the latest version, you will find Uninstall and Update options in Playstore. Just click on Update to get the latest version of WhatsApp application which has this Stickers feature. Once you click on update, it takes some time install the updated version. After it is successfully installed, Open WhatsApp. Open any of your conversation and click on Emoji icon. On the bottom of the screen you should be able to find new icon for stickers (Refer to the image below). Tap on that icon. Now you will get all the stickers that you have recently got. You can view all the available stickers by clicking on the + button at the top. Choose the sticker pack you want to install and then click on the Download like icon beside that sticker pack. Soon after that, sticker pack will be downloaded and installed on WhatsApp. You can now find it when you click on sticker icon while chatting. Along with using these regular stickers, WhatsApp users can now make their own custom stickers. Yes, you can upload your photo and make it an emoji and you can share it with your friends and family. All thanks to WhatsApp because it allowed third party applications to make custom emojis and stickers to import them to WhatsApp app. So let’s start on How to create custom whatsapp stickers to make stunning stickers for your WhatsApp conversations. One of the best part of this new WhatsApp roll out is – they have exposed APIs for the developers and designers across the world to create their own custom whatsapp stickers and publish apps on Google Playstore. Users can install those apps and they can able to use these stickers right from the WhatsApp app itself. This allowed Android or iOS app developers and enthusiasts to create apps with WhatsApp stickers. We are going to use one of such app t create custom WhatsApp stickers here. So let’s start with the procedure on How to make custom whatsapp stickers in a step by step guide. Step 2: Open the above link and install that app on your Android mobile. Step 3: Now open Sticker maker for WhatsApp app. You will find Create a new stickerpack option. Just tap on that to start creating a custom sticker pack. Step 4: Provide Sticker pack name and sticker pack author details and click on Create option. Step 5: A tray icon will appear now and when you click on that you will get two options to pick the images – Take a photo or Select File. If you want to create a custom sticker by taking a photo right now, you can choose Take a photo option. Otherwise click on Select File option. It will ask you permission to access Media files on your android mobile phone. Step 6: You will get different option to import the images. You can import them from your gallery or google drive or Google Photos etc. Just click on the photo you want to send as a WhatsApp sticker. Step 7: Now that photo will be imported to Sticker maker app and you need to draw an outline with your finger to select the sticker area. After you draw the outline, you can see the preview and you will get option to Try it again. If you are OK with the sticker, then Click on Yes, SAVE STICKER option. Step 8: Follow the same steps to create stickers for other photos as well. Once you are done with all, click on Publish Sticker Pack option. You will get message like You want to add stickers to WhatsApp. Click on ADD option. That’s it. Your published WhatsApp stickers will be found on WhatsApp application. Open any WhatsApp conversation and go to stickers tap. You should be able to find all the custom stickers you have created on Sticker maker app there. You can choose memes, some random photos and even your own photos to make stunning stickers out of them. If you are facing any issues importing the stickers to WhatsApp app, that means you haven’t received the latest version of WhatsApp. Just follow the steps mentioned at the starting of this article to update the WhatsApp application and check WhatsApp stickers feature. There are few limitation with this Sticker maker for Whatsapp app. Listed down them below. You can create only 30 stickers in one sticker pack. If you want to create more than 30 stickers, then you need to create another sticker pack and make stickers in that. Once the sticker pack is published, you can’t edit it. Suppose you have published a sticker pack with 10 stickers and later if you want to add more stickers to that, you can’t do that. You have create a new sticker pack in this case as well. You can’t even delete few stickers that you don’t want in a published sticker pack. Drawing outline with finger on the screen is not much comfortable. It often leads to improper stickers. There is no robust feature to draw it perfectly. There are more and more apps are being uploaded to Google playstore with unique and stunning features. You can also any of the other application to make custom stickers and publish to WhatsApp. WhatsApp stickers improves the chatting experience and it helps the people to express their feeling which cannot be described in words. WhatsApp even gives an opportunity for the app designers to create custom WhatsApp stickers and import them to WhatsApp. If you are an app developer, there are few guidelines you have to follow in order to create Custom WhatsApp stickers app. You can find the guide lines here – WhatsApp sticker app guidelines. There are stunning and creative sticker apps are being created recently. Just select anyone and make your conversation more compact and beautiful. We have chosen Sticker Maker app here to create Custom WhatsApp stickers. Just follow the steps mentioned to get the stickers right into your WhatsApp application. I’m wrapping up this article on How to make custom WhatsApp stickers. Cheers!